This past week we were in Green Bay for several days. On the last day we’d checked out of our hotel at noon. Alice’s appointment was for 2:30 and was supposed to take an hour and a half. Since we had our dog Franco with us, my options for hanging out were a bit limited. Without the dog, I probably would have driven to the big Fleet Farm store and hung around the hydraulic hoses for the 4 hours. It was a hot enough day that I couldn’t leave Franco in the car, so we came up with a different plan. Green Bay is split by the Fox River, and near the place where Alice’s appointment was, there was a developed hiking trail along the river. So Franco and I spent the 4 hours hiking. We found one place along the path that had a relatively sandy beach and was intended for canoe and kayak launching. Franco cooled off in that stretch of the river several times that day. I threw his stick in the water and he happily retrieved it for me many times. When we got tired of the water, we walked a mile or so and found another bench to sit on for a while and watch the water flow by. We were unable to enter any shops because one of us was a dog, so we just stuck to the outside. At one point we met a couple of guys hanging out under an old trestle bridge. I don’t know if they were homeless, but they were in pretty rough shape. Franco took to them immediately, and we talked and they threw the stick for Frank, who brought it back to them over and over. I thought about those two guys a lot during that time. I was kind of rudderless for that 4 hours, and saw it as a kind of adventure. For these two guys, it might just be the way they were living. It made me think about all the good things I have and how much I take for granted. We drove home that afternoon, and spent the night in our own place. I think we were all very happy to be home. The next day a severe storm came through. The predicted 70 MPH winds were exceeded for a while. 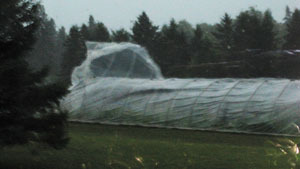 Our greenhouse cover did not fare well in that storm. I’ve since been able to mostly patch it up, but after this season, it’ll need to be replaced. This storm also knocked down a lot of trees, which knocked out our power for most of the day. In one way it was a kind of a good thing, because I was pretty tired from the trip, and was able to rest a bit. But once I got up and going, every project I could think of required power of some sort. We had no water, so I couldn’t bottle some of the wine. I could have worked on the greenhouse, but needed my table saw in order to make the lumber I needed. Once again, I needed to stretch myself. I was outside my comfort zone and had to make do. Those two incidents made me think about stretching myself. You build a life for yourself that contains the things you want and need. The tendency is to wrap these things around you like a cape. But I think we can get a little lazy too, and when life throws something unexpected our way, we can be ill prepared for it. I think the trick is to march outside that comfort zone now and then. At least in my life, those marches are the circumstances I remember the best. This entry was posted on Saturday, July 23rd, 2016 at 9:09 pm and is filed under Uncategorized. You can follow any responses to this entry through the RSS 2.0 feed. You can leave a response, or trackback from your own site. We so enjoyed being with the two of you today… Holding you both in my heart. Saw a bear on the way home on Tower Rd. 🙂 Also a coyote later on U.S, 2 and lots of deer. We too are so glad to come home and have a place tht has given us roots and some wings too over the years. Gratitude for the gifts we often forget to notice. Have to love the U.P.